Now, here's a great deal: Get FREE shipping on Quantum Storage Systems Conductive Stack-and-Hang Bins and Dividable Totes. If you have storage needs for your sensitive components these Quantum products provide a durable, high-grade, economical solution. 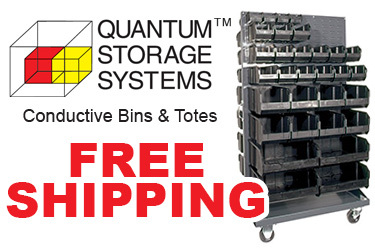 Visit our "Free Shipping on Quantum Storage Systems Conductive Bins & Dividable Totes" page to take advantage of this FREE shipping offer. For additional Quantum products, check out our Quantum Storage Systems page. You may also contact us by phone (800-966-6020), email, or via our Web site.